WEST PALM BEACH, Fla. — Feeding South Florida is stepping up to help federal workers affected by the ongoing government shutdown. On Tuesday, the food bank is hosting a distribution event in West Palm Beach. Volunteers are giving out fresh fruit, vegetables, protein, and non-perishable food to furloughed federal workers. The organization is also collecting food donations from the public. 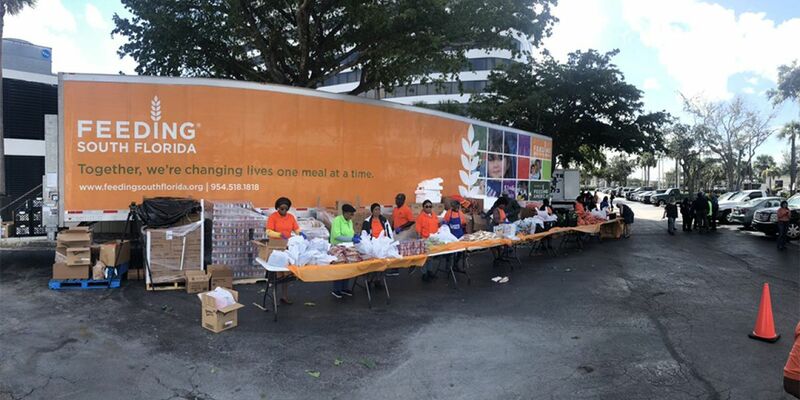 GOV’T SHUTDOWN FOOD DRIVE |Volunteers of Feeding South Florida are distributing fresh fruit, vegetables, protein and non-perishable food in West Palm Beach to furloughed federal workers. How you can help --> https://bit.ly/2HnV9Yo Tonight at 5:00 on WPTV. Feeding South Florida, which is based in Pembroke Park, says it's helping some 2,600 TSA workers, Coast Guard members, and courthouse employees who are furloughed. The organization is asking for food, as well as monetary donations to assist families who are working without a paycheck. Feeding South Florida is the leading hunger-relief organization serving Palm Beach, Broward, Miami-Dade, and Monroe counties. It distributes 50.5 million pounds of food every year to more than 700,000 individuals. To donate click here. If you’re interested in volunteering, click here.